Katy Perry put on an amazing Super Bowl halftime show on Sunday, with four costume changes, a huge mechanical tiger, and blessing some of us oldies with Lenny Kravitz and Missy Elliott. 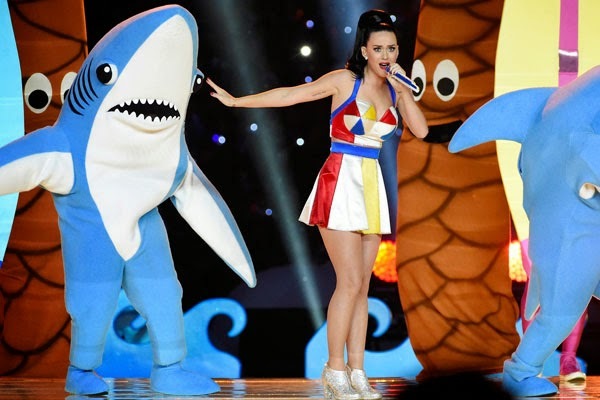 However, some say the MVP was one of her dancers wearign a shark suit. Since then, everyone has been talking about the LEFT SHARK and how he forgot the dance moves to mass merriment! After seeing some funny memes on Twitter, I wondered if the dancer, that is the actual human being in the suit felt bad about all the jokes that was being poked at him. Turns out the guy is Scott Myrick, and he is actuallygreat eye candy! And he doesn't really mind the attention. Check him out below and how he joins in the fun, saying; BREAK THE SUPER BOWL! "The sharks were given two main objectives. One, perform Katy's trademark moves to the Teenage Dream chorus, which they both did perfectly; and two, to have loads of fun, and bring to life these characters in a cartoon manner, giving them a Tweedledee/Tweedledum-type persona. "Clearly, that was portrayed with the overzealous shark on the right hitting precise dance moves, while the left shark was playing up the more goofy, fun-spirited sports fan mascot type, who was just happy to be at the Super Bowl. We love the laughter and joy this moment has created for the world and think the left shark nailed it! Don't forget…we all have a little left shark in us." This is me in DTLA's Art District being... artsy.. and stuff.